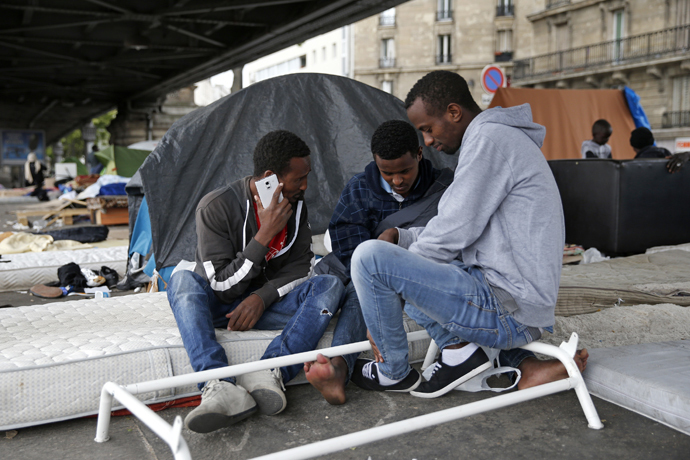 Hundreds of African migrants living in a shantytown in northern Paris, women and children among them, have been told to leave their tent camp after authorities said they posed high risks of epidemic sicknesses spreading in the French capital. The migrants' makeshift camp, set up in the middle of last summer, initially hosted just a few refugees from Sudan and Eritrea. It has quickly grown into a village harboring migrants from all over Africa. 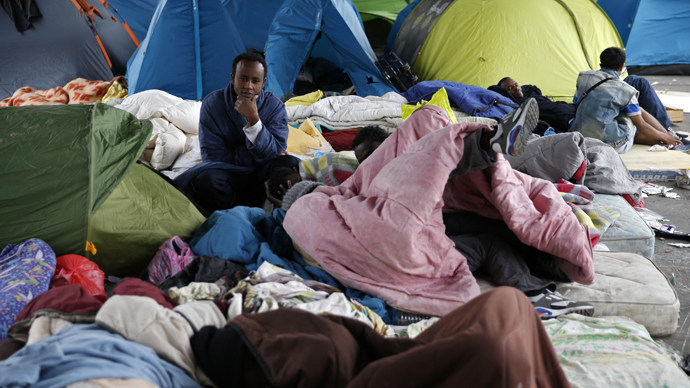 According to estimates by the France Terre d'Asile humanitarian association, between 200 and 400 people currently live on the site, located beneath the over ground Metro tracks near La Chappelle. Most of the refugees are men. There are women too, and some toddlers who sleep in tents or on mattresses scattered on the ground. Despite the recent installation of public toilets and frequent waste pickups, the overall health situation at the site is next to disastrous, according to reports. Most of them chose to stay in the northern reaches of Paris for one simple reason. The camp is just steps from the Gare du Nord and the Eurostar terminal, from where trains head daily to Calais. The channel port in the north of France, the closest crossing point to the UK, has already become home to 2,500 migrants. 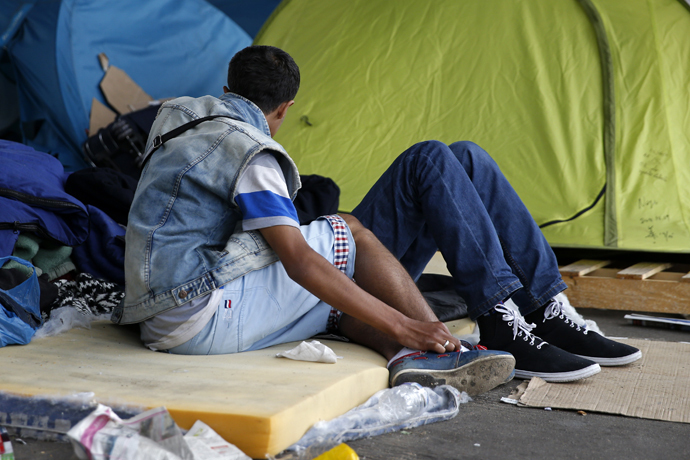 "I have tried three times to get on a train to Calais, but each time the police caught me and threw me off," Amanuel, 21, from Eritrea told the Local. "We try to hide in the toilets, but it’s difficult. We’ll try again. That’s our life for the moment - but we hope it will get better once we reach the UK," he added. Not all want to go to Great Britain, though. Saudia, who came to Paris from Ethiopia last month, says she prefers to stay in France. "But where can I go in my state?" she told France 24, striking her belly. The 26-year-old Ethiopian is expecting a child, and says England is of no particular interest to her. “Now I'm tired, but I am well here. There are doctors nearby [at the hospital a few steps from the camp]. There are associations which provide us with food," she told the French broadcaster. She says some caring local residents worry about the children's lot and come to the camp to give them fruit. "Tell them to share apples and clementines with the youngsters, they are full of vitamins," an old lady from the area, struggling to make her way between the mattresses, said. The dismantling of the camp is set to be accompanied by some lodging solutions and relocation of its inhabitants. "The issue of relocations is not yet settled," Le Parisen has quoted Pierre Henry, director of France Terre d'Asile, as saying. According to a police source, the dismantling of the camp could take place some time next week. Earlier this month, RT also explored some of the make-shift immigrant camps under the Charles de Gaulle Bridge in central Paris, where about 500 illegal immigrants, mostly from Africa, are sleeping on the streets or in two camps squeezed between the Austerlitz and Gare du Nord railway stations. An RT correspondent reported that some refugees have been camping out for days, others months. Most of them refused to tell their stories for fear of being exposed and expelled from the country. Many were trafficked from countries like Libya and had to pay thousands of euros to criminal gangs to transfer them to Paris. “I come from problem… you know… Darfur?” one man murmured in broken English. “I don’t have a home, do you know what that’s like?” another one said in French. In a bid to shift the migration burden away from Italy and Greece, the European Union said it plans to relocate 40,000 asylum seekers to other EU countries, according to a draft document cited by AP on Tuesday. The relocation proposal, set to be unveiled next week, would see new Syrian and Eritrean asylum seekers shared among 23 of the 28 member countries over the next two years. Britain, Denmark and Ireland will not take part. The influx of immigrants has left many European countries, namely Italy, Greece, Malta, Germany and Sweden, exhausted by the burden, with the number of those crossing the Mediterranean to get to Europe currently on the rise. Over 80,000 have arrived so far this year, while the International Organization for Migration (IOM) estimates that 1,820 others have died or gone missing on their risky journey. Under the proposed emergency relocation plan (which would have to be backed by member states and the European Parliament) countries "will receive 6,000 euros ($6,531) for each person relocated on their territories" from EU coffers, AP reports. Germany would accept the lion's share of asylum seekers over the two years — a total of 8,763 — while France would shelter up to 6,752.